Are you rooting for a team for the upcoming world soccer games? I am! That’s why I teamed up with Cacique and Latina Bloggers for a dish to make that represents the team I am rooting to win. And here it is, Mexico! 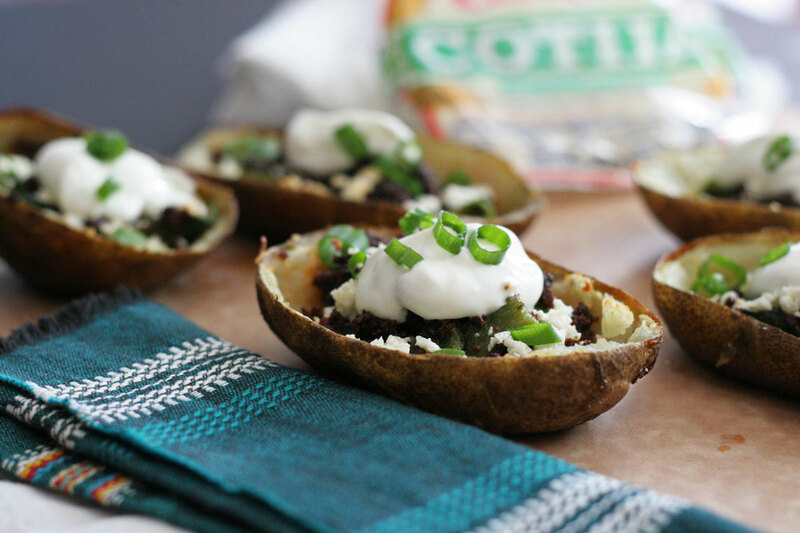 I made my Mexican take on a traditional American potato skin using Cacique cotija cheese, poblano peppers, and chorizo. All to represent the Mexican flag colors, which is awesome! I’d like to thank Cacique for featuring this recipe on their Cacique Blog! Serving appetizers for sports gatherings is always a plus, and people love little nibbles. 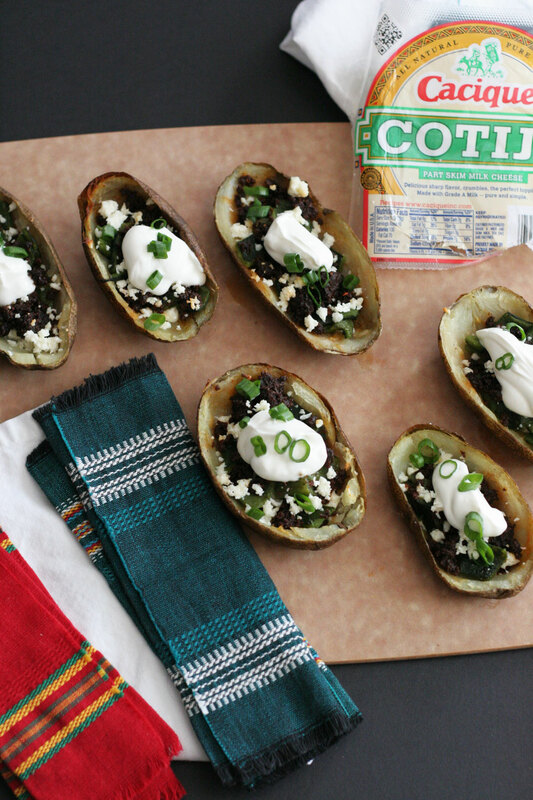 I went through several ideas of foods that represent the Mexican flag and landed on this flavorful and beloved potato skin dish. But the real treat comes in the form of chorizo, roasted poblanos, and amazing Cacique cotija cheese, my Mexican twist. It is a robust flavored crumbly cheese, that is the perfect accompaniment to what is traditionally sort of a cheesy dish. I opted for this strong, and perfectly flavored cotija to go with other typical Mexican flavors. What made me think of this appetizer is pretty funny. I was sitting watching a show with Brian, and we were tossing ideas back and forth for this post. A commercial for potato skins showed up on the TV, they actually looked so gross, which was the funny part. But not one second after the commercial was over, we both look at each other and said potato skins almost simultaneously. Obviously I made them my own, the furthest possible from what we saw on the TV. I came up with the ingredients soon after I saw that commercial because they were not so appetizing and I needed to put a pretty picture of the dish in my head. This still makes me giggle. From a gross thing on TV these tasty bite sized treats were born. I suppose that happens more often that I think because as recipe developers we are inspired from all things, good and bad! Give these a try for the world soccer games, summer parties, or any occasion. They really are perfect small bite that are easy to make ahead of time, and warm up before your guests arrive. Which is always a plus in my world. Let me know what you think! Have you used Cacique products before? I have been using them for many years, and my Mama used them in her kitchen since they started the company many years ago. They are a wonderful company, I am happy to be working with them for this soccer food campaign. They have a variety of products from cheese, chorizo, to other diary products. 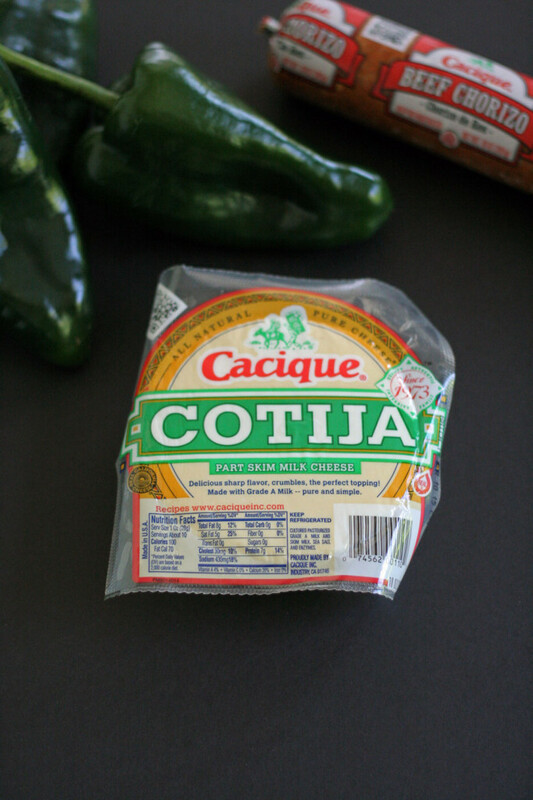 I used their cotija cheese, and beef chorizo products in this post. And seriously, these are so good! Note: Place one oven rack in the middle of the oven, and the second one on the top. 1. 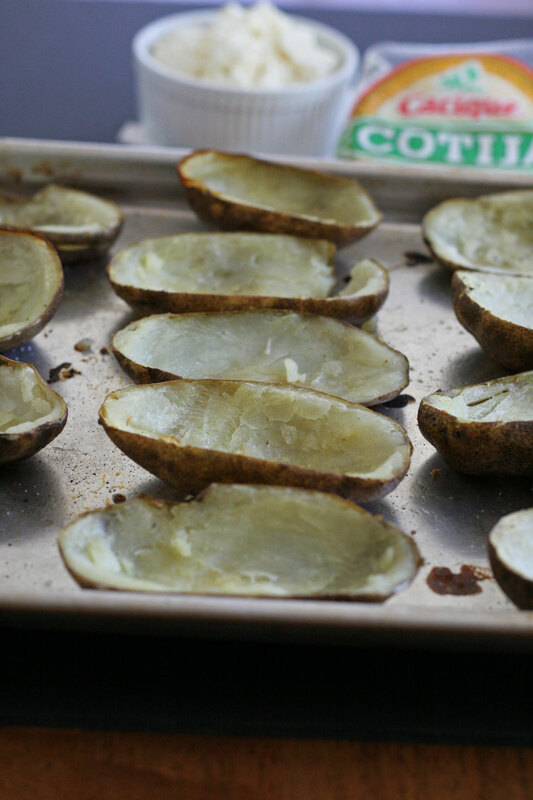 Place potatoes on a sheet pan, put in the oven and bake for about 1 hour. While the potatoes are baking cook the chorizo. In a medium saute pan, place over medium heat, and cook chorizo for about 10 minutes, or until fully cooked. (Note: no oil is needed to cook the chorizo, it has enough on it’s own.) Place cooked chorizo on a plate lined with a few paper towels, allow to drain well. 2. Remove potatoes from oven and allow to cool enough to handle. Raise oven temperature to 450. Place poblano peppers on a sheet pan, and place on the top oven rack for 5 minutes. Remove peppers, turn, and place back in oven for 5 minutes. Remove and allow to cool. 3. Cut potatoes in half, and scoop out center leaving about 1/4 inch. Use center for another use, mashed potatoes or fold into potato salad. Rub each half with olive oil, and place on the sheet pan skin down. Sprinkle with salt and pepper. Place in oven in middle rack for 10 minutes. While the potato skins are baking, work on poblanos. Remove the skin by peeling. Pull the stem off the top, and de-seed the inside of the pepper. Chop, and set aside. Note: You can prep the potato skins one day in advance up until this point, and place in the fridge in an airtight container. On the day you are serving them, remove from fridge, and preheat oven to 450 degrees, and place in oven with the cheese, poblanos, and chorizo. Bake for 10 minutes. 4. Remove potato skins from the oven. Sprinkle about 1-2 teaspoons cotija cheese first, then 1-2 teaspoons poblano peppers, and last 1-2 teaspoons chorizo. Place back in oven to crisp for 10 minutes. Work on lime sour cream. Place sour cream and lime in a bowl or jar, mix to combine. Serve immediately with a dollop of sour cream and sprinkle of chopped green onions. Go team! Disclosure: This is a sponsored paid post with the Latina Bloggers, and Cacique. Per usual all opinions are my own. These sound great and I love they are the color of the Mexican flag. Your recipes are always do good. Thank you. Thank you so much, Celeste! I appreciate it, I hope you are well.